Are You Disappointed? Is God? I didn't accomplish growth in my ministry the way I had hoped and wondered at times if God even called me to ministry or if that was a dream of my own making. In fact, I didn't do anything to "make things happen." I simply lived each day, often in survival mode, leaning on God's everlasting arms and the faithful promises of His Word. Am I disappointed that I didn't accomplish what I felt I should or could have? Maybe a little. Perhaps the more important question is, Is God disappointed? I look at friends and acquaintances who have thriving ministries of their own, who are out winning souls and doing great things for God in the spotlight of His favor and anointing. I look at the successful authors I know who are writing and selling more books than I could ever imagine and wonder why success is so elusive for me. That's easy...they are working at it harder than I am and devoting more time to promoting their writings and book-signing events. How I admire their tenacity and the heart that drives them to market tirelessly that which God has given them to share with the world. Is my failure to do these things a disappointment to God or merely to myself? A long time ago I gave up comparing myself and my success with that of others. What I hoped would be an exciting year of fruitful ministry for me became a year of surrender to God and all He planned for our family in the wake of my husband's unexpected job loss and the financial reversal that followed. That journey became my ministry as I allowed God to draw me closer to Him and use what we were going through to encourage others in similar circumstances. The job God gave me, which now consumes my productive hours and takes me away from marketing and ministry activities I thought were necessary to reach others for Him, has become my mission field, a place where I can make a difference every day. If you are feeling disappointed over your failure to achieve the goals you set for yourself in 2012, take a prayerful look at all God did in your life this year. The goals we set and achieve in the New Year may impress others and accomplish good things in our lives and theirs, but it is only when surrender ourselves to God's purposes for us that we will find true success and fulfillment. God is never disappointed when we walk in full surrender to Him. We can never fail, even though our plans aren't accomplished as we envisioned them, as long we are letting Him call the shots. He can do far more with a surrendered servant than a person who "makes things happen" without fully depending on God. I pray and believe that the New Year will be a year of great adventure and untold blessings for all who commit themselves daily to walking with God, discovering and doing His will, and living for His glory. Happy New Year! May His blessings abound in your life this year! No matter how hard I try to make each Christmas special, someone comes along and messes up the house I just tidied or does something to make me cranky. I am all about pleasing others but all too quick to be disappointed that the others I am trying to please don't seem to get that Christmas would be less stressful if they'd just pitch in and help without questioning my reasons for asking them to do so. For me, there will never be a perfect Christmas because I am imperfect and so are the ones I'll be spending Christmas with! Come to think of it, there has probably never been a perfect Christmas. Certainly that first Christmas was not perfect, except that it was a celebration of the only Perfect One, Christ himself. The Perfect One was not born in a palace; He was born in a filthy cattle stall. There was no room at the Waldorf, or even at the local hotel. The Perfect One was born of an unwed mother. Although her conception was immaculate and holy, in the eyes of mankind she was probably disdained as immoral and impure. This young girl who carried our Lord was no one's ideal of the perfect mother for God's Son. The wise men who came to find the Christ child did so in fear of Herod, who was bent on destroying the Perfect One. Herod's plan to seek and destroy the Ruler and Redeemer of mankind was thwarted by God's perfect plan to send the wise men home another way and establish his kingdom through the life of the Perfect One. The only perfect Christmas was the Christmas Jesus came into our world. I believe that is by God's design. As long as we continue seeking perfection from anyone or anything but the Perfect One, we will never have peace with one another or with ourselves. There may never be another perfect Christmas, but as long as we make Christ the center of all we do and live in the light of His grace and love, then there is no reason why we can't have a very Merry Christmas. One only has to turn on the ten o’clock news or read the latest headlines to see that we are a society— a world—in turmoil. For some reason, even Christians are prone to cave into the fear that disaster lurks around the corner, ill health is inevitable, and we will never have enough money to make it to the end of the month. Somehow we have forgotten that since the beginning of time, God has been a keeper of His promises, a just and righteous God who cares about each of us, and the giver of the peace which surpasses all understanding. No matter what may come, He is the same yesterday, today, and forever. We can do everything in our power to make a difference in our world, stand for what is right, and oppose all that is evil, but we cannot prevent accidents, catastrophes, or the willful acts of sinful men against humanity. However, even when our lives seemingly spin out of control we can trust that God is in control of every aspect of our lives because He is sovereign. For the sinner, He is Savior. For the weak, He is strong. For the sick, He is healer. For the needy, He is our ever-present help. For the faithless, He is faithful. For the lost, He is the way, the Truth, and the Life. For those who are invisible to the eyes of man, He is the God who sees. For the powerless, He is sufficient. For the empty, He is the fulfillment of our hearts’ desires. For the friendless, He is the friend who sticks closer than a brother. For the weary, He is our strength and sustainer. For the broken-hearted and lonely, He is the Lover of our souls. If you struggle with uncertainty about what the future holds, ask yourself this question: Do I trust the One who holds my future? If you know God, then you must trust him because He Is. One of my favorite songs of the Christmas season is not one you might hear play on the radio, but our choir sings it every year. "I Have Seen the Light" is a favorite which always brings our congregation to its feet in true worship of the One who came to be the Light of the World. Jesus called His followers to be light and salt in our generation, that others might come to know Him and experience the miracle of salvation that leads to eternal life. I am ashamed to admit that I spent much of the weekend after Thanksgiving in a very dark place, consumed with frustration, disappointment, and anger over my failure to accomplish everything on my to do list. The joyous anticipation of decorating my home for the holidays was dampened by a heavy spirit of despair because things didn't turn out quite the way I planned. Rather than focus on the Reason for the season and count my blessings, I became depressed and filled with self-pity. It took deliberate effort to make myself unpack the decorations and place them around my home. After assembling my pre-lit tree, I plugged it in and it failed to light up. 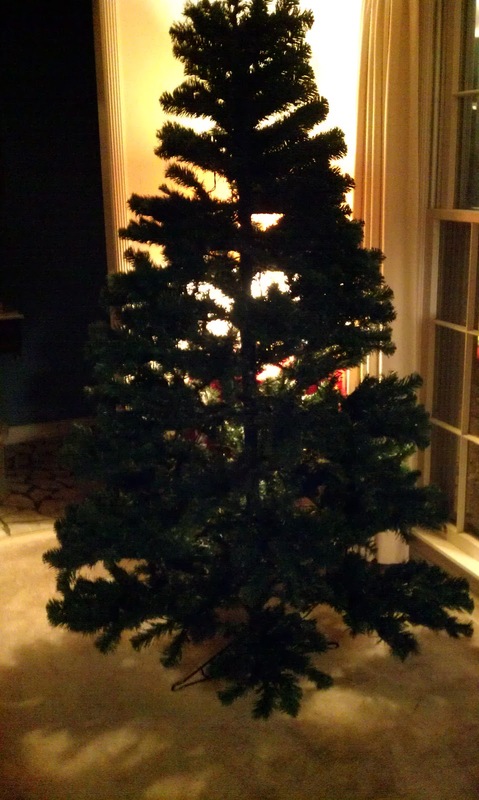 Replacing the fuses and burned out lights on the tree was not enough to fix the problem. An inspection of the electrical socket and wiring revealed no obvious defects. The only thing I could do was call the Christmas tree hotline and seek a remedy from the maker of the Christmas tree.